I have been fascinated by calligrams long before I learned that that’s what they are called. 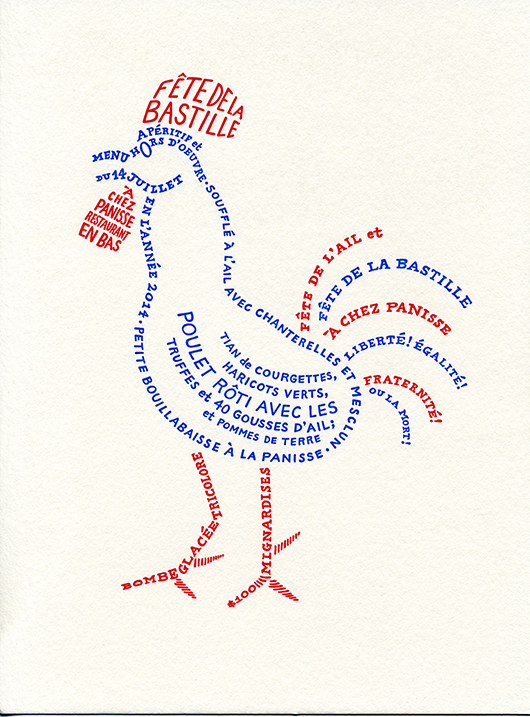 And, for as long as I can remember I’ve wanted to create a menu design in this way, I finally got my chance this Bastille Day for Chez Panisse Restaurant! The main course was chicken so my strutting rooster felt quite fitting as the image. The proud rooster has, also, always felt so perfectly “French”, as he appears in all sorts of traditional French emblems and motifs. I love the charming playfulness of this design. Thank you Alice for making one of my dreams come true!